Nov 21 how do you measure hope? 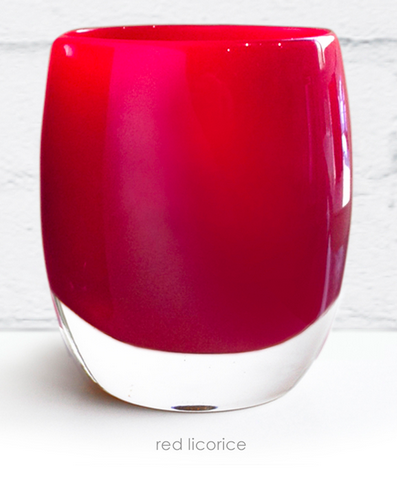 our gorgeous and generous 'red licorice' votive. during the launch of our new, exclusive 'red licorice' glassybaby, we would like to tell you about our giving partner for this amazing color, the "rosemary ford future of oncology nursing scholarship" to help train the next generation of great nurses. Kathleen Shannon Dorcy is a doctor and a nurse. she was a nurse first, before she studied for her PhD in nurse training, and wrote a dissertation about hope. specifically, she analyzed the transcripts of conversations between oncologists (cancer doctors) and patients, cataloguing their different metaphors and manners of speech, and then looking at which patients ended up choosing to undergo an experimental cancer treatment. she would probably deny it, but we think it's safe to say that she received her doctorate in hope. Mrs. Dorcy says that nurses have many jobs. they must deliver care and they must have highly-refined scientific and clinical skills. on top of that, a great nurse must "let people find their own stories." that means assessing options for cancer treatment with the right balance of hope and data. it means asking people to consider how their treatment choices will fit in with their lives, in a holistic way. glassybaby giving team, scca representatives, and scholarship recipients with infectious smiles. our healthcare system needs more great nurses, and especially nurses with a broad understanding of the human experience. that's why we are proud to help fund the Rosemary For Scholarship Fund with 10% from all sales of our 'red licorice' glassybaby. each 'red licorice' you buy donates $50, which goes directly into the scholarship fund to help pay for tuition and mentoring for current college students who will soon enter nursing school. the scholarships also help support current seattle cancer care alliance nurses who are pursuing a master's or doctorate degree, which makes them so much more effective in their work. "it's a wonderful gift to be a nurse," says Mrs. Dorcy. "we have such a trusted role in people's lives." a trusted role, and a crucial role. thank you for your support to help train more great nurses in our community. a proud scholarship recipient from Seattle University. good luck Eleanore. mericos rhodes loves hiking and growing food. he also loves to write copy and blog posts for glassybaby. we love to spread kindness; thanks for joining us. Nov 27 vibrant, beautiful, and nearly impossible to make.